For whatever reason, homeowners of the past had terrible taste when it came to bathrooms. Colorful toilets and bathtubs, garish wallpaper and tile, oddly placed or absent storage and dozens of other design crimes make outdated bathrooms almost unbearable — but they also make for fun projects for creative and enthusiastic homeowners. If you have a bathroom sorely in need of an update, you don’t have to smash your piggy bank for the funds. Here are the updates you absolutely need to make and how you can save money on the rest. One of the fastest, easiest and cheapest ways to immediately pump value into your bathrooms is to install tile. You can find attractive tile at your local home improvement store that is hardly more costly than the linoleum or plastic currently surrounding your bathroom. Plus, if you are going to have a splurge item in the bathroom, it should be your shower, which is the most eye-catching and important feature of the room. Laying tile yourself isn’t as intimidating as it sounds, even on the vertical walls of your shower. You will need the right tools: a ceramic tile saw, a notched trowel, a level, a measuring tape, etc. And, you might want to lay out your tile pattern on the floor before you start applying tiles to the wall, so you can be sure you like their look. Larger tiles are easier to work with because they require less measuring, cutting and placing — and fortunately, large tiles are very much in style. Bright-colored glass tile, especially in shades of blue, are also en vogue as is cement tile in black and gray patterns. Good lighting makes any space look more expensive, so it’s worthwhile to invest time and effort into installing attractive, modern light fixtures in your bathroom. General wisdom states that more light is always better in the bathroom, and overhead, task lighting is best. It’s also important that you have the ability to adjust the intensity of your lights, so dimmer switches are a must. Lights should be balanced — meaning one side of your face shouldn’t be brighter than the other — and they should be soft, coming from behind or in front of your face, not directly above it. Lighting trends change quickly, so it’s best to match your light fixtures to the feel of your room rather than any passing fashions. However, if you still want to wow visitors with your cool style, you should opt for Art Deco over Mid-Mod and natural materials over industrial fixtures. Opting to follow upcoming trends instead of those in full-swing means you’ll be able to enjoy your décor for longer. A bathroom with poor plumbing is no bathroom at all. While it might be more fun to choose tile, countertops, cabinet features and more, you should save some room in your bathroom update budget for repairing or replacing inefficient plumbing. Low-flow faucets, dual-flush toilets and similar plumbing fixtures reduce the amount of water you use in the bathroom, cutting your water bill and your consumption of finite resources, which is good for you and the environment. Plumbing is one of those projects that you probably shouldn’t do yourself, even if you have a bit of DIY experience. This is because any small mistake in plumbing will result in a major problem down the line. It’s better to call an expert in your area, like a Houston faucet repair service, to fix or install new plumbing fixtures in your bathroom. Finally, an updated bathroom has one final important feature: storage. 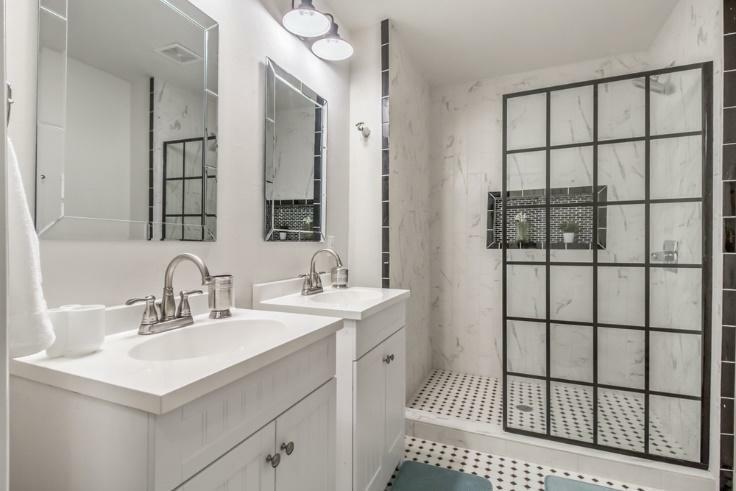 You likely have more things to store in your bathroom than ever before, from towels and washcloths to beauty products, medications, styling tools and more — and other homeowners are no different. It’s inconvenient to visit a hall closet to get the things you need, so you should update your bathroom with as much storage as possible. If your bathroom is small, you might have to be creative with your storage solutions. Under-sink storage is ideal, but you might also consider installing shelving above the toilet and above windows and doors. Using hooks and tension rods inside cabinets can give you more storage options, too. It’s also a good idea to cut back on clutter in your bathroom, so you can make the space seem larger without paying for an addition. Bathrooms get old fast, but with the right updates at the right time, you can enjoy attractive (and functional!) bathrooms for a decade or more — and you don’t have to break the bank to do it.